Imagine, then, the scene in 1961. The technical advance generated by the great marques throughout the 1950s has blossomed into the early '60s to create a new and exciting period in motor racing. Ferrari are poised, expectant but uncertain, with their first rear-engined sports-racing car as the new season approaches. The Ferrari Dino SPs, the first-ever rear-engined sports prototypes from Maranello, went almost straight from the drawing board to some tryly remarkable performances on the world's racing circuits, carrying many records with them. 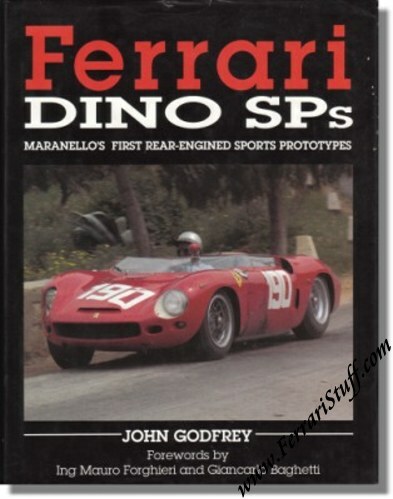 How this was brought about is the theme of John Godfrey's deeply reserached book; himself a former owner of one of these rare and celebrated machines, he is well qualified to write with authority and warmth an account of a group of cars that were not only remarkalble in themselves, but also had a lasting influence on motor racing history.